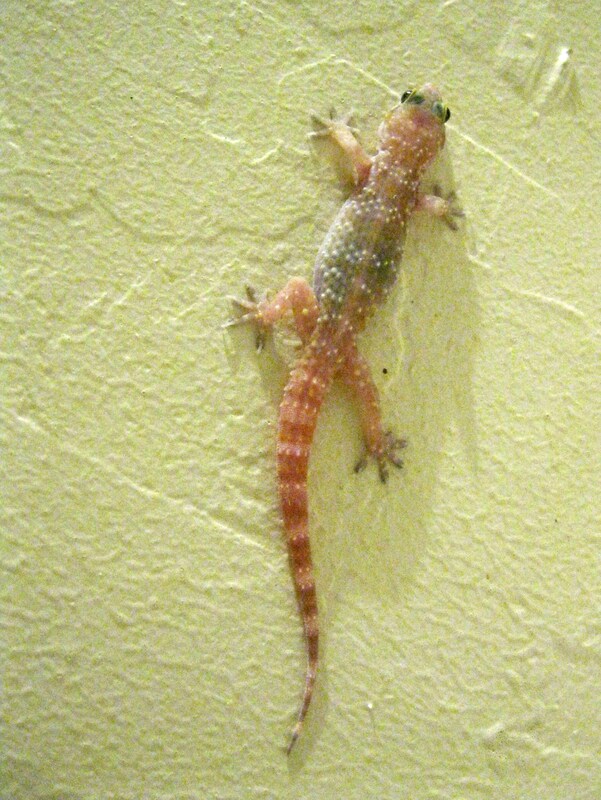 A pair of Mediterranean House Geckos (Hemidactylus turcicus) has taken up residence on my parents’ back patio here in southern Arizona, coming out at night to climb the walls in search of insects. Between the poor lighting and the fact that the little buggers scurry quickly away when you get too close, this is the best photo I was able to get, but they’re cute little things. Geckos have a lot of interesting characteristics that make them stand out from other lizards. The specialized toe pads that let them walk up walls and even across ceilings (even glass ones!) with ease are hypothesized to rely on the Van der Waals force, which is just crazy. Some (including this species) produce little chirping noises, something most lizards are unable to do. Even though these aren’t native to North America, I’ve never heard of them becoming invasive and causing any significant problems for native lizards – as their name suggests, I think they tend to stick close to buildings. Like the Peach-faced Lovebirds, another non-native species found in my parents’ neighborhood, I like them too much to really wish them ill.
A very useful sort of lizard! and awfully cute!